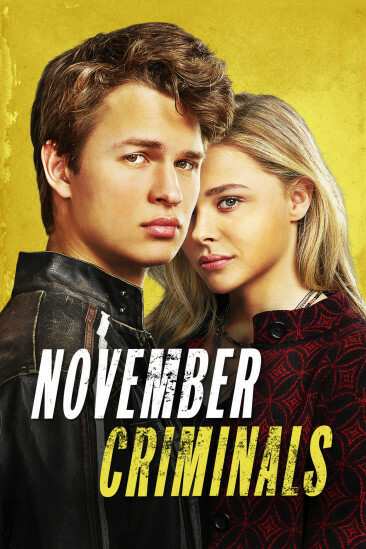 November Criminals follows the story of Addison (Ansel Elgort), a high school senior in Washington, D.C. who just recently lost his mother and is preparing for life after graduating. He has recently started going out with Phoebe (Chloe Grace Moretz) and they are starting to build a good relationship together. Things change when Addison gets word that a friend of his was murdered just hours after having an interaction with him. The media and police claim that the murder happened because of gang involvement but Addison doesn't believe it. With the help of Phoebe he starts his own investigation into the death of his friend to find the truth. The story here has a lot of great ideas but as it progresses it feels as if the execution just isn't there. It felt like the story could have gone the route of racism or how the media constantly jumps to early conclusions, instead the filmmakers decide to play it safe. At times it feels like the main story takes a back seat to the relationship between Addison and Phoebe. While both characters do get a nice amount of development it would have been nice to have seen more time dedicated to the main story. Like with Addison's friend Kevin, who is the character that is killed in the beginning, there could have been more done with his character. There is a brief scene with the three of them at a coffee shop and then Kevin gets killed immediately after. It would have been nice to have a little more to grab onto with the character that the entire film is based around. To bridge off that even more, there's really not a whole lot to Addison and Kevin's relationship. It's established they are friends sure but it seems as if Addison isn't even all that close with Kevin. Which brings up the question as to why he cares so much to prove that his friend isn't a part of a gang. Maybe I'm reading a little too much into things but I couldn't help but ask these questions throughout the film. Despite those grievances I had there is enough here to make things worthwhile. Ansel Elgort shows again that he is a really solid actor and he does a fine job leading in this role. The relationship between him and Chloe Grace Moretz works well since we do get to spend a lot of time with both characters. David Straithairn as Addison's dad and Catherine Keener as Phoebe's mom both give good performances as well and are perfect parental figures for the film. The only performance I found to be underwhelming was from Cory Hardrict, as a drug dealer, who felt like he was trying a little too hard each time on screen. Overall it is certainly the performances and the pacing of the story that make this a somewhat worthwhile film. It's hard to get past the fact that the filmmakers don't want to focus their full attention to the main, more interesting part of the story and that's what makes this somewhat of a disappointment. This is definitely worth seeking out but it had the potential to be so much better.